South Korea’s Defense Ministry on Monday unveiled a new defense vision based on information and communication technologies, and other cutting-edge digital platforms to better counter evolving North Korean threats and other security challenges. During its New Year’s policy briefing to President Park Geun-hye, Defense Minister Han Min-koo said the ministry would push to incorporate into military operations innovative technologies such as ICT, big data solutions and the Internet of Things, under the “Creative Defense” vision. Capitalizing on the country’s technological savviness, the ministry will step up efforts to develop future weapons systems such as combat equipment using laser beams and electromagnetic waves, and unmanned platforms, he said. “In consideration of the limited defense resources and various security threats, we will push to come up with more creative, innovative ways to manage our military, going beyond the old approach that was mainly about catching up with others rather than moving ahead of them,” Han told reporters after the policy briefing at Cheong Wa Dae. 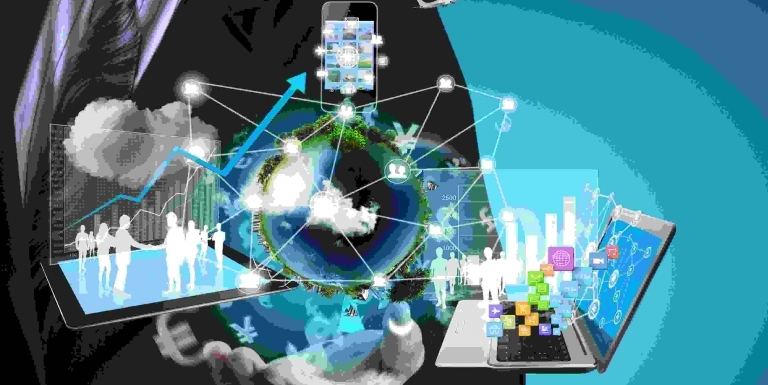 Korea’s exports of information and communications technology (ICT) products and services reached a record high of $170 billion last year, the government reported Thursday. According to data released by the Ministry of Trade, Industry and Energy and the Ministry of Science, ICT and Future Planning, ICT products accounted for almost 30 percent of the nation’s $573 billion in exports, contributing to a 2014 trade surplus of $86.3 billion. 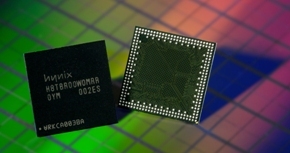 Semiconductors were the top ICT export category, thanks to DRAM and 3-D NAND flash memory chips. In 2014, memory chips became the nation’s first export product to surpass $60 billion, increasing 9.6 percent year-on-year to reach $62.7 billion. Semiconductor exports surged 33.2 percent last year to a record $34 billion, while shipments of system semiconductors slumped 9.8 percent to $22.5 billion. Exports of display panels slipped 3.2 percent, as demand dropped in China, Hong Kong and Southeast Asia. Chinese producers of cheaper panels also dragged down prices for LCD televisions. This year the Ministry of Science, ICT and Future Planning (MSIP) will invest 3.9520 trillion won (US$3.578 billion) in research and development (R&D) on areas of science and technology and Information Communications Technology (ICT). The MSIP announced on Jan. 4 that it has confirmed the “R&D Business Comprehensive Implementation Plan,” which invests 2.9037 trillion won (US$2.63 billion) in Science and Technology and 1.0484 trillion won (US$949.12 million) in ICT. The investment scale this year, which excludes research and operating expenses of the National Research Council of Science and Technology and research institutes under the direct control from its total R&D budget of 6.5138 trillion won (US$5.9 billion), is to grow 7.9 percent compared to last year. 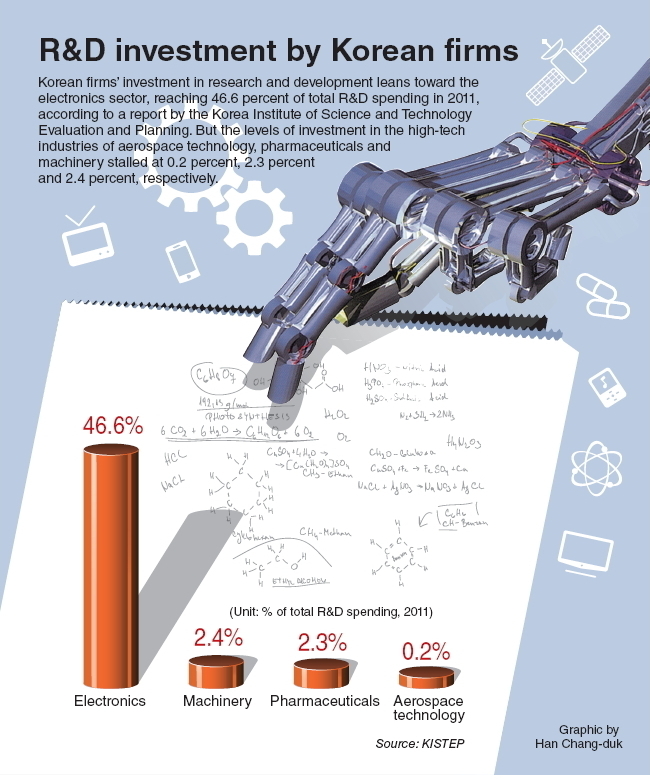 By sector, technology development accounts for the largest part of the budget with 2.2508 trillion won (US$2.04 billion), following basic research with 744.3 billion won (US$673.88 million), foundation construction with 640.2 billion won (US$579.63 million), commercialization and standardization with 161.7 billion won (US$146.4 million), and science and technology and ICT manpower training with 155 billion (US$140.33 million). For full article, see BusinessKorea. Along with the definition, the government announced six strategies. Starting a business will become easier, with proper rewards for creative ideas. Small and medium enterprises will play a lead role in an economy that large conglomerates or chaebol have traditionally dominated. The government also plans to encourage the integration of science and ITC into existing industries to add value and competitiveness. It also wants to educate students to foster creativity and entrepreneurship, and plans to invest more in science and ICT. The last strategy is to create a culture where good ideas are freely communicated and brought to reality. Although the government has laid out somewhat specific goals and detailed plans to achieve them, the public is still learning to understand what a creative economy is, while foreigners remain largely confused. The Korea Times’ Business Focus talked to foreign experts to hear their perception of a creative economy and the most important ways to achieve it. The four interviewees visited Korea in June to participate in the Global Industry and Economy Forum 2013, which the state-run Korea Development Institute and the Ministry of Strategy and Finance organized. “For continued growth, we must aspire to become a creative company capable of leading change. Erecting our R5 institute was one such chance for precipitating the change and advancement required for becoming a truly creative company,” said Shin Jong-kyun, Samsung Electronics mobile unit chief. 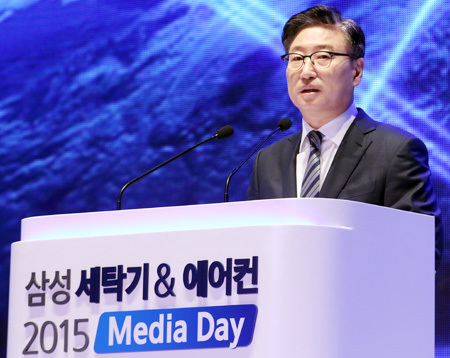 His speech was on the day Samsung held a ceremony for marking the move into Samsung’s newest mobile research institute, the R5, in Suwon, home to the world’s largest consumer electronics company and chipmaker. Industry watchers said both the speech and the ceremony signaled that mobile products and services would continue to be the nerve center for Samsung, which this month celebrated the 20th anniversary of the “New Management Initiative” by chairman Lee Kun-hee. Research and development is cited as one of the most significant driving engines behind Samsung’s growth into a global electronics powerhouse. Korean government established an ambitious goal of doubling the size of cultural contents export, to USD 10 billion, in 5 years. Ministry of Culture, Sports and Tourism (MCST) is preparing a mid-to-long-term plan for such goal, to be announced in May. The plan will iterate the plans to develop ‘killer contents’ in 5 genres, game, music, animation & characters, movie and concerts. MCST presented its 2013 business plan to the President on the 28th, which includes the aforementioned goal. MCST plans to work with Ministry of Future Creative Science on its mid-to-long-term plan to create a healthy ICT environment by converging the planning and creation of contents with their distribution and consumption, which is being handled by the two ministries respectively. The close-cooperation between the two areas is essential to the success.